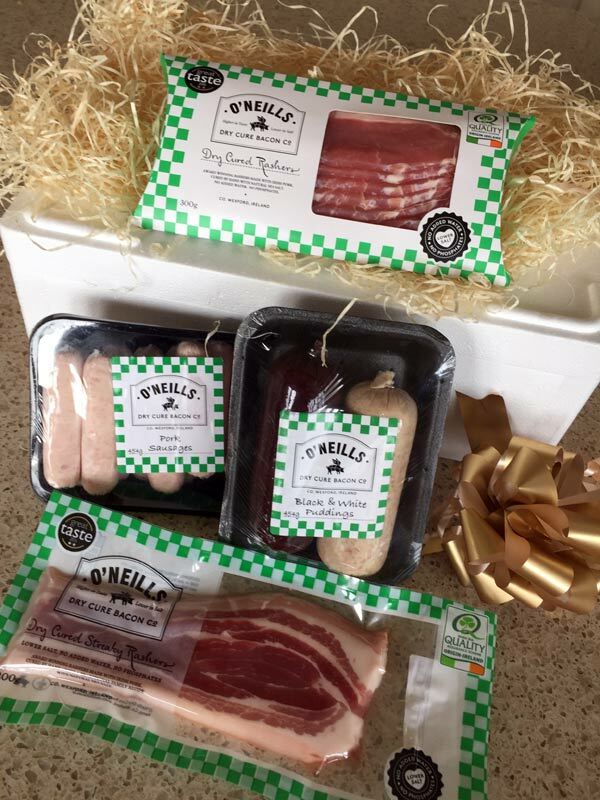 O'Neills Dry Cure Bacon Christmas Gift Box - O'Neills Dry Cure Bacon Co.
FREE DELIVERY ON ALL ORDERS OVER €75 ! View cart “O’Neills Bacon Jam 200g” has been added to your cart. **Please Note – To guarantee freshness, orders containing Breakfast Boxes can only be delivered Thursday & Friday. WHITE PUDDING: Bacon (27.5%) (Irish Pork, Sea Salt, Sugar, Antioxidant: Sodium Ascorbate, Preservatives: Sodium Nitrite & Potassium Nitrate), Irish Pork (27.5%), Water, Onions, Pinhead Oatmeal (GLUTEN), Rusk (WHEAT flour (GLUTEN), & Salt), Oat-flakes (GLUTEN), Rice Flour, Corn Flour, Seasoning (Salt, flavorings, dried blood, spice extract, dextrose, stabilisers: sodium phosphates and potassium phosphates). © O'Neills Dry Cure Bacon Co.